Acne / Spots/ Pimples/ Zits most commonly affect teenagers but can be seen in any age group. Typically acne suffers will experience oiliness of the skin around the face, upper parts of the chest and back. In some cases, acne can be so severe that it can leave scaring. Spots can be painful, red or yellow with whiteheads and blackheads or a mix of all these features. There are many treatments both prescription and over the counter for acne. Whilst over the counter treatments may be perfectly suitable for the mild acne, one may need to consider prescription treatments when the response to over the counter treatments may be in adequate. The aim should be to identify the type of acne and use a treatment that is most likely to target the specific type of acne. 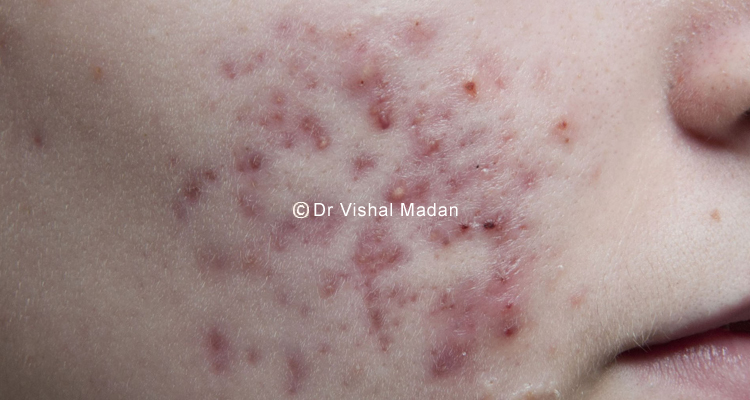 Most treatments will target only a specific type of acne lesion but some will be ‘broad spectrum’ that is to say target all the lesions seen in acne. Oral antibiotics, creams or gels, chemical peels, laser light all improve acne. In case of females, oral contraceptive pills may be helpful. Isotretinoin is one medication that has a very high success rate in the treatment of stubborn acne. This can be prescribed only by a fully trained dermatologist who understands the way the medication works and is able to monitor the treatment carefully. There are many myths around acne and roaccutane treatment. It is important to consult a fully qualified consultant dermatologist who can discuss the right treatment for the type and severity of acne. Treating acne early can prevent scarring, both physical and psychological.